Register for Mardi Gras float 2015: civil discobedience! 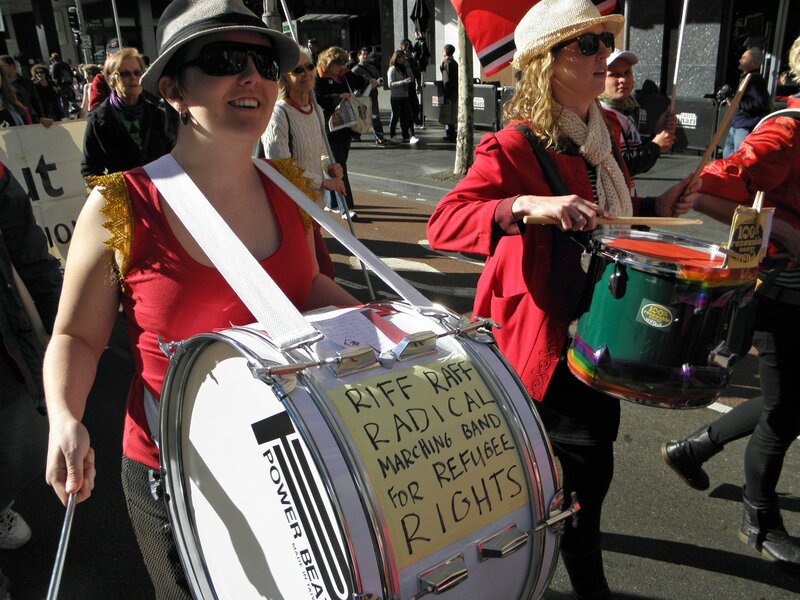 Riff Raff Radical Marching Band have a float in the 2015 Sydney gay and lesbian Mardi Gras. It is going to be huge. Places are limited – so you need to register on this form so we have your details and can confirm final numbers. You can either be part of the band, a dancer, or a other/support person (helping make amazing props, holding signs or other support roles). Entry fee is $20 (or $15 concession, or less/free for people that are unwaged) to cover the cost of our application, float, props and costume pieces/fantastic hats. You’ll need to organise your own red, black and silver outfit. You need to attend two rehearsals on Sunday February 15th and Sunday March 1 – we need to know the songs damn well (since the parade is loud and chaotic) and we need to be able to march (very quickly, and together). Dance rehearsals to learn the choreography are also on these dates. On the day, you need to be available from after lunch on Saturday March 7th to around 10pm. We spend some time preparing and arriving at our designated spot inside the Mardi Gras area. You have to be there hours before the parade begins (but it’s very fun and you get a chance to check out other floats/have a boogie). Inspired by our friends fighting big coal to protect the Leard Forest (and the Pilliga, Gloucester, Bulga and more), we’re going to have a CIVIL DISCOBEDIENCE theme. We’ll fabulously call to put a stop to coal and gas mining – we’d love it if you wanted to join us. Posted in Uncategorized	| Comments Off on Register for Mardi Gras float 2015: civil discobedience! Riff Raff Radical Marching Band from Chloe Hughes on Vimeo. Supporting refugee rights in Sydney – No Malaysia Solution! Posted in blog	| Comments Off on Supporting refugee rights in Sydney – No Malaysia Solution! Riff Raff say no to coal seam gas in St Peters! Posted in blog	| Tagged coal seam gas, Dart Energy	| Comments Off on Riff Raff say no to coal seam gas in St Peters!